Adding to the length of your hair is a sure-fire way to improve your looks. This is why hair extensions are quite popular these days. The trouble is that hair extensions can be complicated to use, especially for first-timers. Hair extensions are often attached using methods like fusion or weaving, but these can cause damage to hair and can make the wearer feel uncomfortable. 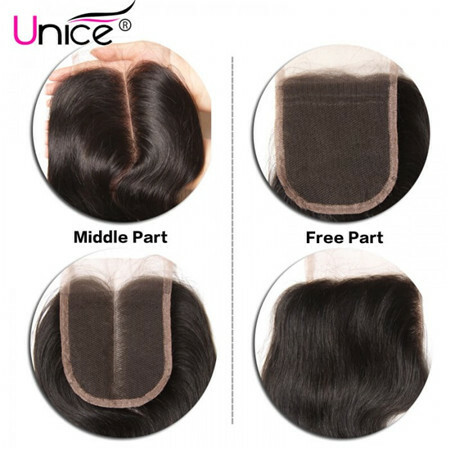 Fortunately, lace closures sold by shops like UNice Hair Company provide a convenient way to use hair extensions. Why buy a closure ? 1.Closures are extremely versatile and allow you to protect all your hair. 2.A hair closure ensures that your hair will blend well and it helps prevents damaging the hair you leave out. 3.Having a leave out usually causes your hair to break off from the excessive heat from flat ironing and curling your hair. There are quite a few alternatives to choose:free part,middle part and three part closure.We have introduced the free part closure and three part closure and the difference between them in the previous post,today let’s talk about the middle part hair closure. What ‘s a middle part lace closure? A middle part lace closure is a lace closure with middle part. Middle part, baby hair around, has been bleached knots. Pure imported lace which It's more soft,more comfortable. Medium brown lace color closed to real human scalp! We add more hairs to the middle part area to make it more natural ,realistic and long lasting. 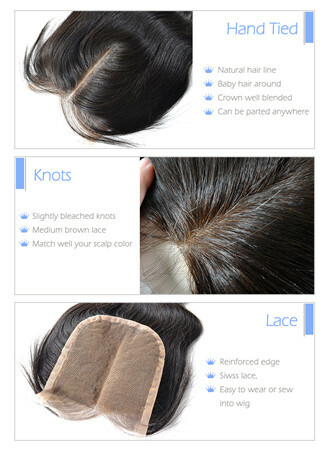 Click to get more middle part hair closures with baby hair!!! What is the difference between middle part hair closure and others? 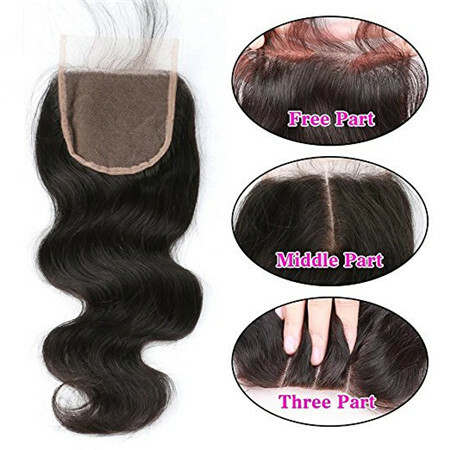 1.Middle parts and three part closures are types of pre-parted closures. 2.Pre-parted closures are beneficial because they can be easier to install and, depending on how they are installed, can allow you to switch between different side parts, as well. 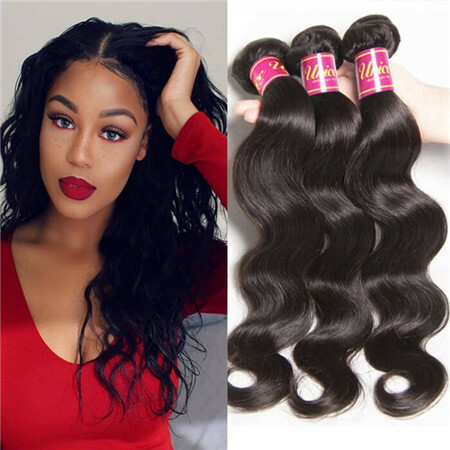 3.However, when wearing a sew in lace closure with a three part, the Brazilian hair, 100% virgin hair or synthetic hair will need to be installed without any errors because if the closure is even slightly off, the whole wig will look bad. 4.Another thing to remember with a three part is that, while it can provide a fun and unique look, the part doesn’t always look natural. Even when a three part is properly installed, you can sometimes still catch a peep of the other parts that you are trying to cover. 1.A free part is the most natural looking type of lace closure. 2.Unlike pre-parted closures, free part closures don’t look bad at the slightest error in the installation process. 4.With pre-parted closures, it’s virtually impossible to lose where you part your hair, but because you have the flexibility to change your part with a free part closure, it can be more difficult to train your hair to part in a specific place. What parting should I get? 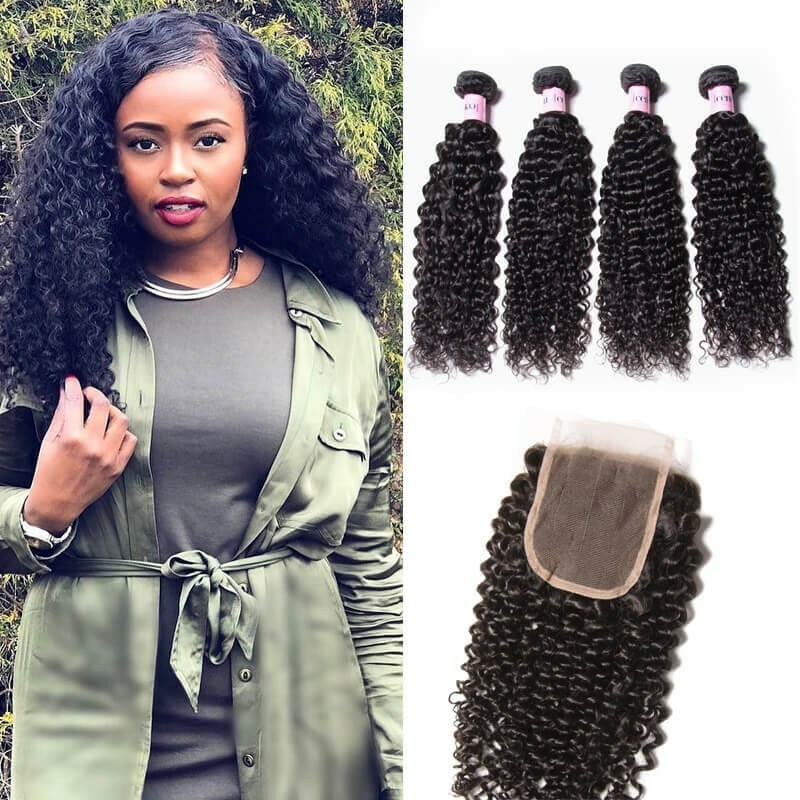 One part closures come with a parting in the center.This can be arranged by a stylist to go anywhere,in the center or either side to provide a parted to look your hairstyle.These come 4*4 inches area. Freestyle hair closures have a realistic hairline,which can be parted anywhere.Freestyle closures are extremely versatile you can have no parting or if you are looking for an angled,diagonal parting this is the closure for you!! 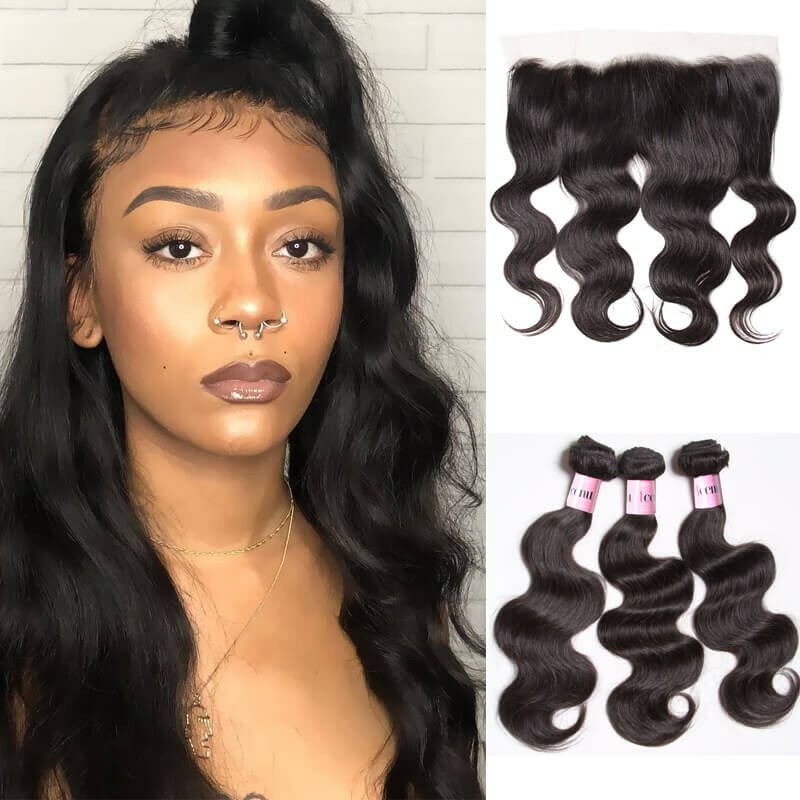 Three part closures are one of best sellers,unique and created by our very founder.This closure allows you the versatility of changing parting at any time with ease.Middle,left and right parting all at yo convenience. Middle parts can be made to look more natural because natural hair can be parted perfectly down the middle. Additionally, your stylist can add in extra hairs around the part to make it appear more natural. What length do you recommend? 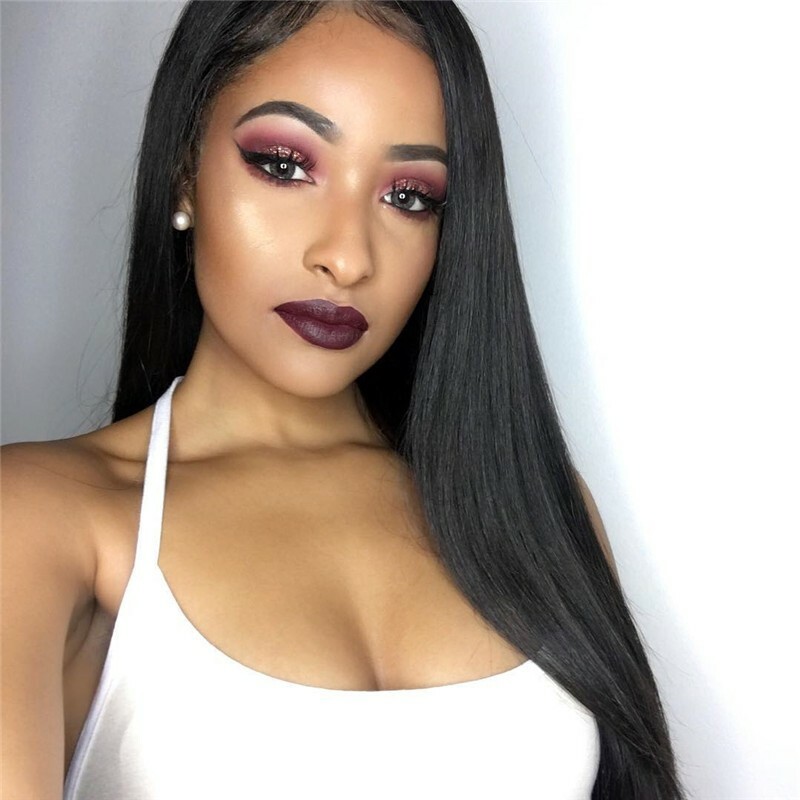 Which length to buy depens on the look you want to active and what length the rest of your hair is.Your most likely want to buy a closure shorter than the length of the rest of the hair.For example,if you are buying all 12” hair you probably wouldn’t buy a 16” closure. How ever if you have longger length closures the closure length is down to preference. You could choose longer length closures since there are no concrete rules when it comes to hair. For more information on the closure please check out our previous post. How To Install A Closure? Closures are not very hard to install at all. By following a few simple steps, you can achieve a closure that looks realistic. 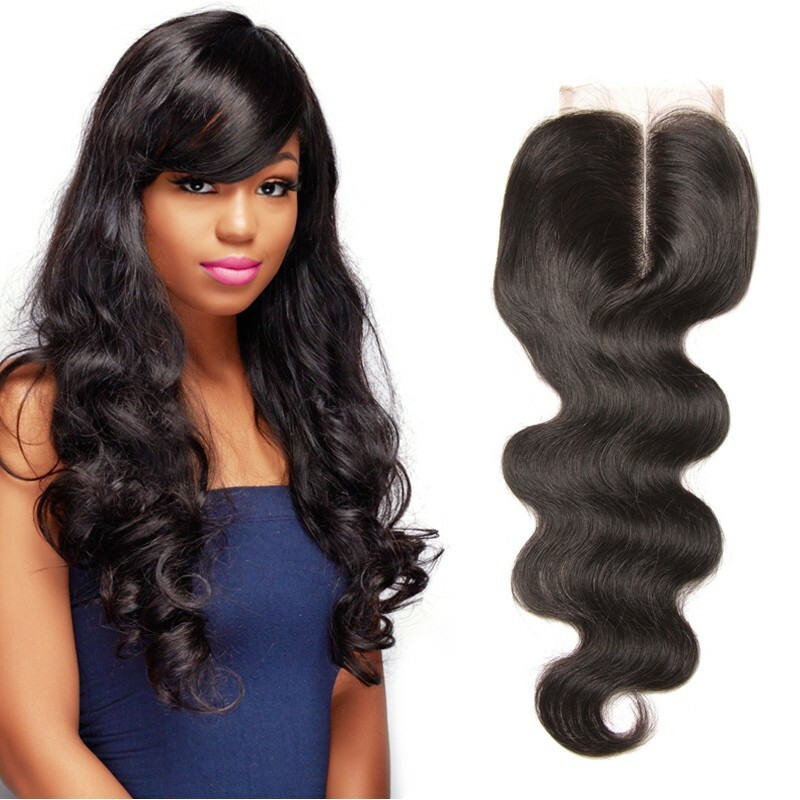 Here are the standard steps to installing a closure. 1.Braid your hair down so that the closure can lay flat. You want your closer to lay down as flat as possible to create a natural look. 2.The next step is probably the most important. You want to make sure your closure is secure. If your closure is on a wig, you can secure it down with straps or even glue it down with some got 2b glue gel. If you are doing a sew in you, want to sew down your closure. Keep in mind that you can also tape down or glue down your closure. 3.You can use a closure in both a sew in and a wig. When installing I highly recommend that you sew the closure tightly down to ensure security. Before applying any other hair to your sew in first sew in the closure. The same goes for when you are creating a wig with a closure. This will allow you an accurate amount of space to work with. This is very important because if done the other way around you may end up not having enough space to sew down your closure. This will also ensure that the closure lays down flat. 4.The next step is adding the remaining tracks to your wig or sew in. You can do this before or after customizing your sew in. 5.Once you have sewn in your closure to your braids or your wig head, it is now time for customization. The first step in customizing your closure is cutting the lace. You can cut the lace straight off or cut it to fit your hairline. 6.Now, this step is optional, but you can pluck the closure along the hairline or even along the part. Lastly, you may want to use concealer or foundation to tint the lace to match your skin tone. If you are using a lace closure make sure to bleach the knots before doing any of these steps to achieve the best results. You can watch the below video to learn how to install a lace closure with hair bundles. Shop Unice affordable middle part sew in. Our middle part closure is perfect for you if you're looking for that flawless middle part every single time.It is available in three styles such as body wave ,straight and middle part curly closure. Natural look:See the wave and color, it might be the top hair band . The beautiful and natural wave 100% match your own. Easily diary caring with comb and shampoo. U just need,we just professional. Bleached well:Our closure has been bleached knot well, the medium brown lace color and natural hairline are designed as real scalp. Together with smart baby-hair around. Silk base:Quite stable and easily install using the well-chosen silk base. Strongly fasten the closure hair around. No tangle, no shedding. 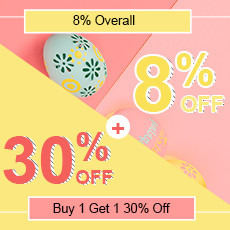 Give u the best hair and silk texture just reasonable in price. High elasticity:Only coming from actual human hair could make highest elasticity and natural circle. Longer hair life time than any other chemical processed one. Trying our best to protect your scalp and suit u well with good product. 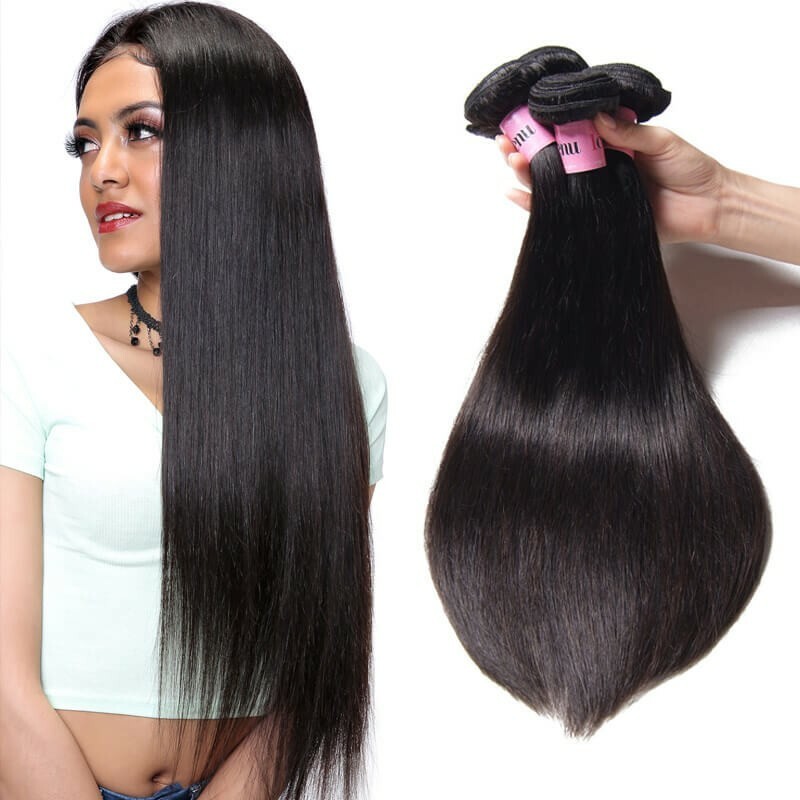 Healthy And Thick End: Healthy hair end without splits and minimum short hairs, and no dryness .The hair have good looking fromthe top to the end. Faq about middle patr closure. Q 1: How Many Hair Bundles Do I Need For A Full Head? 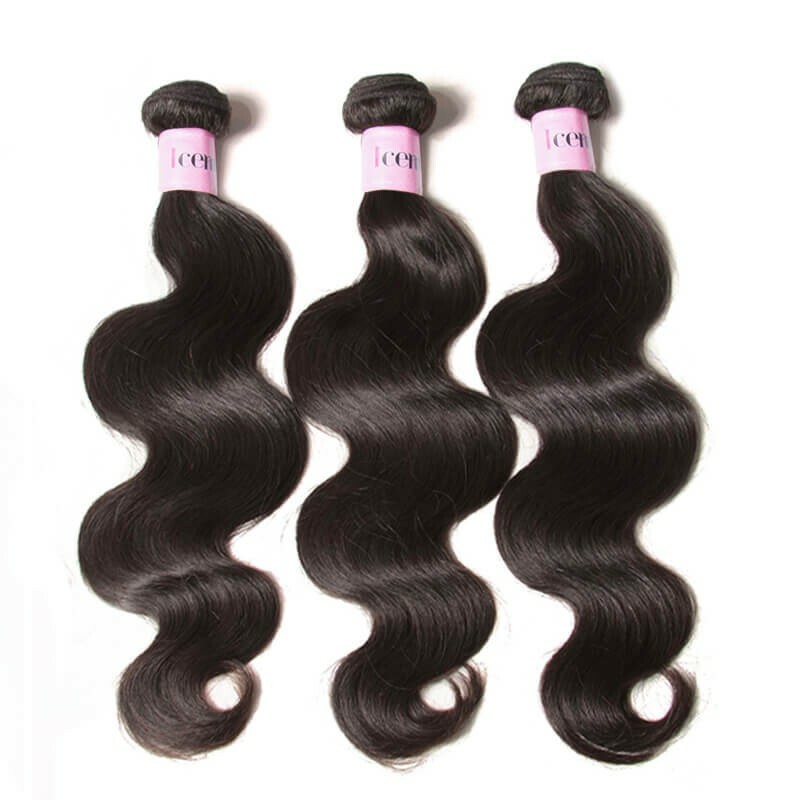 A: 4x4 lace closure/silk base closure, 3-4 bundles hair extensions/hair weft match the best. 13x4 lace frontal closure,360 lace frontal, 2-3 bundles hair extensions will just be fine. Q2: Can the lace closure hair pieces be straightened or curled? A: Yes, treat the lace closure hair as if it is your own. Use a flat iron/ straightener or tongs, even when fitted, but as with your own hair, never use hot tools too often as you could dry the hair and it will not last as long. Q3: Can I dye /color the lace closure hair pieces? A. Yes. The hair can be colored. As a general rule it is easier to darken the hair than to lighten the hair. We recommend to dye darker, not lighter since the hair extension has been processed and colored, it is difficult to fade the original color. Improper dying will ruin the hair. Q4: Can I wash & blow-dry the lace closure hair pieces? A: You can wash them as you would your own, shampoo and condition the hair. We also recommend using a hair treatment on the closure every few weeks, because the hair is not attached to your scalp, it is not getting the oils it should be. Using a treatment/hair mask will help keep them looking healthier and shiny for longer! You will find that you don`t need to wash your hair too much, about every 3 weeks. The hair can be blow-dried on low setting, but it is not recommended to do it too often. 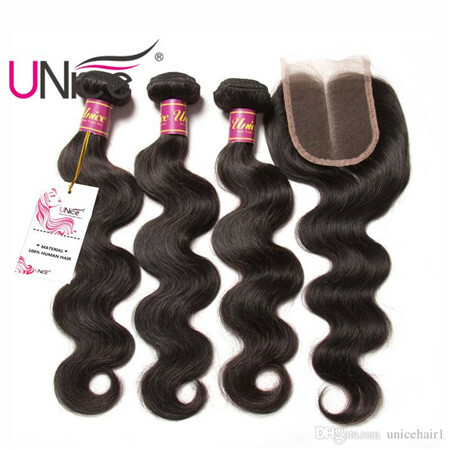 It is best to let your lace closure hair piece dry naturally after washing them. As each individual product may vary, consult your hair stylist for specific instructions. 8. Hair may tangle if general care directions are not followed properly. 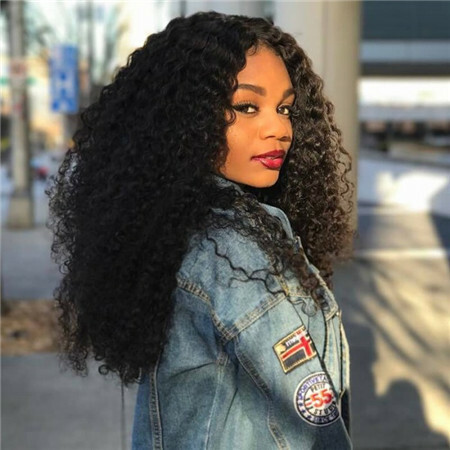 When you wear a lace closure, no matter what type of hair your wig or weave is made out of- whether you wear Brazilian hair, synthetic hair or 100% virgin hair- you have the ability to choose which part you’d like. You can have a pre-parted closure, such as a middle part or three part closure, or a free part closure, which gives you the ability to change your part each day! So which do you prefer? Lace Frontal Vs Lace Closure:what’s The Difference? What You Should Know About Three Part Closure?